EFF, along with other nonprofit groups, filed an amicus brief urging the court to reject the plaintiffs' effort to undermine the DMCA safe harbors. EFF filed an amicus brief arguing that adding “on a computer” to an abstract idea does not make it patentable. EFF filed a brief and argued in Court to stop RIAA's "making available" copyright infringement theory—if someone could have downloaded it from you, you've violated copyright, even if no one ever did. EFF established that computer code is speech and shielded the developers of privacy-protecting software from government censorship. A victory in EFF's fight to end excessive secrecy in patent cases. EFF defended the principle that trademark holders can’t use trademark law to punish free speech just because the speaker happens to use trademarks as a necessary part of activism. EFF invalidated Personal Audio's patents on podcasting, ensuring that everyone is free to create their own podcast on the Internet without the threat of a patent lawsuit. Copyright can't be used to limit consumer choice. EFF filed a brief upholding the right to engage in open discussion about words companies are trying to trademark, without the fear of being sued by the companies under trademark law. EFF, along with allies, filed a brief explaining that allowing patent owners to write a wishlist of anti-competitive restrictions would be a disastrous expansion of patent law, hindering competition, innovation, and your freedom to tinker with and repair your own stuff. The first sale doctrine applies to works made outside of the United States and doesn't matter where something was manufacture—if you bought it, you own it. EFF filed a brief protecting patent first sale—once you buy a product, you own it and the patent owner generally can't interfere with your subsequent use. EFF, alongside other organization, joined with Verizon to argue that every Internet user’s privacy was at risk if anyone claiming to be a copyright owner could, without ever appearing before a judge, force an ISP to hand over the names and addresses of its customers. EFF filed an amicus brief arguing that trademark infringement requires specific knowledge. Legal Case Traffic Information LLC v. Farmers Group. Inc.
A part of EFF's fight to end excessive secrecy in patent cases. EFF defended the right of innovators to build new technologies without begging Hollywood's permission first. Legal Case Chamberlain Group Inc. v. Skylink Technologies Inc.
Fighting the abuse of copyright law to stifle competition, EFF helped Skylink score an important victory in the Federal Circuit that puts much-needed limits on the controversial "anti-circumvention" provision of the Digital Millennium Copyright Act (DMCA). EFF helped defend a printer cartridge company against a competitor's overreaching copyright claims under the Digital Millennium Copyright Act (DMCA). The FBI arrested Russian programmer Dmitry Sklyarov while he was attending a security conference in Las Vegas to discuss the Advanced eBook Processor, a program to decrypt Adobe eBook files. This made Sklyarov the first person to be criminally charged under the Digital Millennium Copyright Act (DMCA). Adobe initially pressed the case, but, after meeting with EFF, called for all charges against Sklyarov to be dropped. Major motion picture studies filed a copyright infringement suit against two companies that made and distributed copies of movies with sexual and violent content removed. EFF protected innovation and fair use by defending "intermediate" copying. Standing up for the public's right to make legal, fair uses of copyrighted material, EFF successfully defended the creators of a parody flash animation piece using Woody Guthrie's "This Land Is Your Land" - and uncovered evidence that the classic folk song is in fact already part of the public domain. Fighting the over-reach of trademark law, EFF signed on as co-counsel to a small travel services company, JSL, after credit card giant Visa convinced a federal court in Las Vegas to prevent the company from using the domain name "evisa.com". Legal Case Newmark et al. v. Turner Broadcasting System Inc. et al. Trademark law at its heart is intended to protect consumers from confusion -- for example by preventing Pepsi from passing off its cola as Coca-Cola. Increasingly however trademark owners are trying to use their trademarks in ways that actually harm consumers by restricting their access to information from and about competitors. EFF helped preserve the legal protections for actually private websites while protecting your right to read public websites. In September of 2011, an astrology software company called Astrolabe filed suit against Arthur David Olson and Paul Eggert, researchers who coordinated the development of a time zone database. EFF established that the FCC and Hollywood don't control your DVR - you do. Ditto.com (formerly known as Arriba Soft) was an early image search engine similar to Google's Image Search. So for example by entering "sailboat" into the Ditto website the searcher would be shown a selection of images of sailboats from around the Web. EFF protected website owners free speech rights against overreaching trademark claims. In a legal battle over Internet music storage that could impact innovation and free expression on the Internet EFF Public Knowledge and other public interest groups asked a federal judge in an amicus brief to protect the "safe harbor" rules for online content in EMI v. MP3Tunes. EFF, together with Durie Tangri LLP, defended a photo hobbyist against an outrageous patent suit from a company that claims to hold the rights to online competitions on social networks where users vote for the winner. The Digital Millennium Copyright Act (DMCA) limits the circumvention of software that's designed to restrict access to copyrighted works. Unfortunately, such a blanket restriction can chill competition, free speech, and fair use. In an attempt to mitigate those harms, every three years the U.S.
EFF and others filed a brief arguing that copyright law was not the proper avenue for Ms. Garcia to disassociate herself with the controversial video, and that the initial order was a prior restraint of speech. EFF backed Internet service providers (ISPs) in an effort to quash subpoenas to more than a thousand unnamed Internet users issued in a predatory lawsuit over alleged copyright infringement resulting from illegal downloading of adult material. EFF joined the American Library Association, the Association of College and Research Libraries, and the Association of Research Libraries in an amicus brief urging a federal court to find that the fair use doctrine permitted the creation of a valuable digital library, the HathiTrust Digital Library (HDL). In recent years, we’ve experienced an explosion of litigation surrounding § 101 of the Patent Act. That section is intended to preclude patent protection for laws of nature, natural phenomena, and abstract ideas. This is fundamental to the patent bargain. Newspaper excerpts are protected fair use. EFF defended a criminal justice blog that provides resources for difficult-to-prosecute murder cases in fighting bogus infringement claims from copyright troll Righthaven LLC. EFF filed an amicus brief in D.C. Court of Appeals arguing that the First Amendment does not allow gag orders that'd prevent Facebook from informing its users that the government had obtained their data, given that the government was seeking the data in connection with users' political speech. EFF set one of the first precedents protecting computer communications from unwarranted government invasion. EFF extended free speech protections online, successfully challenging the constitutionality of Internet censorship laws. EFF defended the free speech rights of a website publisher who had repeatedly received baseless threats from the corporate owners of Barney the Dinosaur. The Lyons Partnership wrongly claimed that Dr. Stuart Frankel's online parody of Barney violated copyright and trademark laws. EFF successfully blocked a brazen attempt to unmask the identities of anonymous members of an online discussion group for embroidery fans. EFF helped protect free speech rights of users who provide online forums for the views of others. In this case, a breast implant awareness activist was sued for defamation in part for re-posting an article written by someone else. EFF protected anonymous speech and fought off a controversial self-help group's abuse of the Digital Millennium Copyright Act (DMCA). 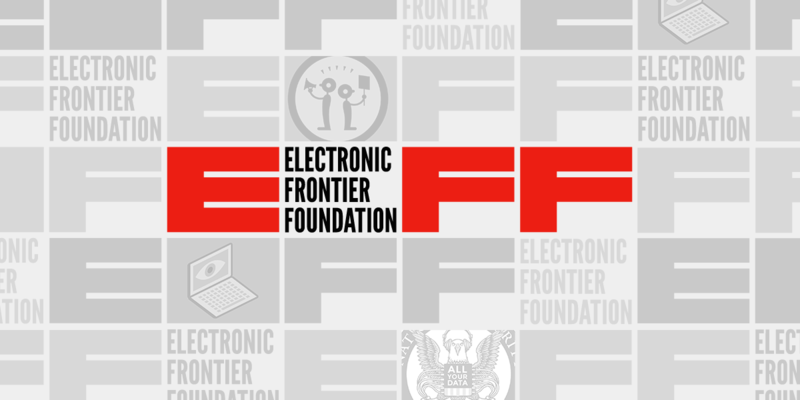 EFF protected online speakers by bringing the first successful suit against abusive copyright claims under the Digital Millennium Copyright Act (DMCA). EFF defended the free speech and fair use rights of an online newsletter publisher after the world's third largest pharmaceutical company that accused him of trademark infringement and cybersquatting. The DVD Copy Control Association (DVD-CCA), a mouthpiece of the Motion Picture Association of America (MPAA), sued dozens of people in venues across the country and around the world for publishing DeCSS, software code that decrypts the data on commercial DVDs. EFF represented Andrew Bunner and Mathew Pavlovich to defend First Amendment rights in technically oriented speech, to fight the misuse of trade secret law, and to clarify the rules on jurisdiction. When former Intel employee Ken Hamidi sent email messages to Intel employees complaining about the company's allegedly unfair labor practices, Intel brought suit. EFF stepped in to protect Hamidi's First Amendment rights, arguing in a friend-of-the-court brief that there was no evidence to suggest that his email had threatened the integrity of Intel's systems. EFF fought for open, transparent governance of the domain name system. EFF helped convince the U.S. Supreme Court to invalidate a dangerous patent law precedent that threatened free speech and consumers' rights. EFF fought for bloggers' rights, defending the anonymity of an online speaker. In two messages from September of 2004, someone writing under the alias Proud Citizen criticized Patrick Cahill, a member of the Smyrna Town Council in Delaware. Legal Case Merkey v. Yahoo SCOX Groklaw et. al. EFF defended anonymous online speakers from frivolous subpoenas. After EFF intervened in the case, an Oklahoma school superintendent dropped his attempt to unmask the identities of a website operator and all registered users of an Internet message board devoted to discussion of local public schools. John Doe is an anonymous poster to two Internet message boards who made two statements critical of a publicly-traded company run by Plaintiff Cullens. In an effort to prevent Doe from further posting his opinions about the company on the Internet Cullens filed a libel suit against Doe in Illinois and asked a California court to force disclosure of Doe's identity. EFF and the ACLU of Northern California filed suit in federal court on January 14, 2009 to protect the privacy and free speech rights of two San Francisco Bay Area community organizations after the groups' computers were seized and the data copied by federal and local law enforcement. The 11th U.S. Circuit Court of Appeals found a Florida man’s constitutional rights were violated when he was imprisoned for refusing to decrypt data on several devices. This was the first time an appellate court has ruled the 5th Amendment protects forced decryption – a major victory for constitutional rights in the digital age. EFF filed an amicus brief in this case. Legal Case Ratingz, Inc. v. Adrian Philip Thomas, P.A. In 2012, EFF used CDA 230 to end a legal threat to a lawyer ratings web site (LawyerRatingz.com) for postings by third parties. In March 2010, EFF filed an amicus brief urging the Illinois Court of Appeals to protect the identity of an anonymous critic who upset a local politician. EFF filed an amicus brief in this case in support of a man who was indicted under the a federal anti-stalking statute for repeatedly tweeting caustic criticisms of a public figure, a Buddhist sect leader who herself made extensive use of social media. In February 2008, Swiss bank Julius Baer filed suit in federal district court against Wikileaks for hosting 14 allegedly leaked documents regarding personal banking transactions of Julius Baer customers. EFF, the ACLU and the ACLU of Northern California moved to intervene in the lawsuit. EFF the Citizen Media Law Project (CMLP) and Public Citizen have urged the U.S. Court of Appeals for the Second Circuit to consider the critical First Amendment questions at issue in a case asserting "hot news misappropriation" -- a doctrine that a federal court used to put time limit restrictions on the reporting of facts. EFF defended online journalists and their rights to protect the confidentiality of sources as offline reporters do. EFF fought the government's attempts to track the location of a mobile phone user without sufficient evidence. EFF handled this leading case with the ACLU of Washington State. In it a federal district court in the Eastern District of Washington held that the identities of 23 participants in an Infospace chatroom were protected from disclosure. On June 13, 2007, the New Jersey Township of Manalapan filed a malpractice suit against its former attorney Stuart Moskovitz, alleging misconduct regarding the Township's purchase of polluted land in 2005. The decision to file suit was met by a lively debate in the regional press and among local bloggers. A federal magistrate judge in San Jose, California denied a government request for historical cell site records, ordering the government to seek a search warrant for the information. The government appealed this order to U.S. Defendant Aaron Graham was suspected in a series of armed robberies around Baltimore. Without a warrant, police obtained 221 days of historical cell site location information about Graham from Sprint. On appeal before the Fourth Circuit Court of Appeals, EFF joined the ACLU, the Center for Democracy and Technology and the National Association of Criminal Defense Lawyers in an amicus brief, arguing police need a search warrant to obtain historical cell site records from a cell phone provider. In this criminal case, the government installed a pole camera overlooking a defendant's front yard and secretly recorded for more than a month. Along with EFF-Austin, the Texas Civil Rights Project and the ACLU of Texas, EFF urged the Texas Court of Criminal Appeals to rule that a person has an expectation of privacy in the contents of their cell phone even when the phone is out of their control or custody. EFF filed an amicus brief with the Massachusetts Supreme Judicial Court, asking it to rule police must get a search warrant in order to access historical cell site information. We argued that as cell phones and especially smartphones become prevalent, and the number of cell towers and cell sites increases, the location information revealed by cell sites becomes more precise. EFF urged the high court of Massachusetts to protect the rights of passengers in cars that law enforcement are tracking with GPS surveillance technology, arguing that both the driver and the passenger of a car have legal standing to challenge the collection of sensitive location data gathered by the GPS devices. The California Electronic Communications Privacy Act (CalECPA), S.B. 178, requires state law enforcement to get a warrant before they can access electronic information about who we are, where we go, who we know, and what we do. For almost 10 years, federal and local law enforcement agencies across the country have engaged in a massive and secretive telephone surveillance program known as “Hemisphere.” In July 2015, EFF had enough with the secrecy. We filed two separate lawsuits to force law enforcement agencies to release important information that would contribute to the public debate about the efficacy and legitimacy of the program. EFF, along with Earth Rights International, represented activists, attorneys, journalists and others in fighting back against subpoenas issued by Chevron to email providers demanding information that would have provided a broad window into the movements as well as personal and political associations of our clients. EFF held Sony BMG accountable for infecting its customers' computers with software that created grave security vulnerabilities and let the company spy on listening behavior. Andrew “Weev” Auernheimer was convicted of violating the Computer Fraud and Abuse Act ("CFAA") in New Jersey federal court and sentenced to 41 months in federal prison in March of 2013 for revealing to media outlets that AT&T had configured its servers to allow the harvesting of iPad owners’ unsecured email addresses. Nascimento worked as a cashier at the deli counter of a convenience store which had a lottery terminal. The store allowed employees to sell and validate lottery tickets for paying customers but prohibited them from purchasing lottery tickets for themselves or validating their own tickets. EFF fought for transparent elections, forcing e-voting companies to comply with North Carolina state law. EFF defended the use of voter-verifiable paper trails in Florida. EFF and ACLU won a ruling that the government must turn over information from criminal prosecutions in which federal law enforcement agencies obtained cell-site location information without a warrant. In EFF's lawsuit, a judge ordered the government to release previously withheld documents about intelligence agency misconduct.